The World Youth Chess Championship or WYCC 2012 is around the corner. Slovenia which is situated in Europe will be hosting the biggest and most important chess event for junior chess players. How many young players from all over the world will participate? How many Malaysian junior chess players will fly to Slovenia to take part in the world age group event? Based on its official website, 1587 young chess players from more than 100 countries around the world will compete in the WYCC. Sixteen (16) of them are Malaysians. It is quite a big number since the expense to take part in the event for a Malaysian player is quite a lot. Looking at the entry statistics among the ASEAN countries, GiLoCatur found that Malaysia has the highest number of participants. On the other hand, Vietnam which won the most individual gold medals in the ASEAN Age Group held in last June has twelve (12) players taking part. Singapore which had won more medals than Malaysia in the same event is sending nine (9) players. Surprisingly, both Philippines and Indonesia which had better medal tally than Malaysia has NO and only ONE representative respectively. Who do you think the only representative from Indonesia? The clue is he had played in the KL open and made an amazing winning streak. Believe it or not, not many junior chess players can afford to take part in the WYCC 2012 in Europe even for a player living in a developed nation like Canada. Hopefully, the story of a 12-year-old-girl from Canada named Ashley Tapp can be an inspiration and motivation for us, the Malaysian chess community, to raise enough money needed for an international chess stint. Ashley had embarked on a fundraising activity to collect 8,000 (surely Canadian dollars) so that she can make the trip to Slovenia and compete in U12 Girls category in the WYCC 2012. The BIG QUESTION here is can we, the Malaysian chess community - both parents and chess-playing children alike, emulate a fundraising program which include playing chess for donations and selling items on line like what Ashley did in her country? To find out yourself about the similar obstacles and problems (1. parents have to carry entire financial burden, 2. no or lack of sponsors, 3. chess does not have rightful place in schools, 4. parents have to pay high tournament fees) encountered by a chess player in other countries like Canada and in our country, go to the website here. GiLoCatur would like to wish ALL THE BEST to all the sixteen (16) Malaysian players competing in the WYCC 2012. Best of Luck also from GiLoCatur to Ashley Tapp, a Canadian girl chess prodigy. It is quite klise. It is a common expression. In fact, it is an idiom. GiLoCatur hopes Malaysian nowadays youngsters know what an idiom is. Why GiLoCatur uttered the above idiom? In less than two weeks the long school holidays will begin. The new year of 2013 will come leaving the year of 2012 in about two months. It also means, year wise, that GiLoCatur's age of a very good number of 44 will increase one more year. What else chess parents like GiLoCatur will plan for their chess-playing children? Register the children for chess tournaments, right? Especially during the weekends. It is important for parents like GiLoCatur to make sure that the children occupy the children's school holidays with beneficial and good activities. It is very fortunate for chess parents like GiLoCatur because almost on every weekends there are chess tournaments being held in both coming November and December months. Let's check out one by one. 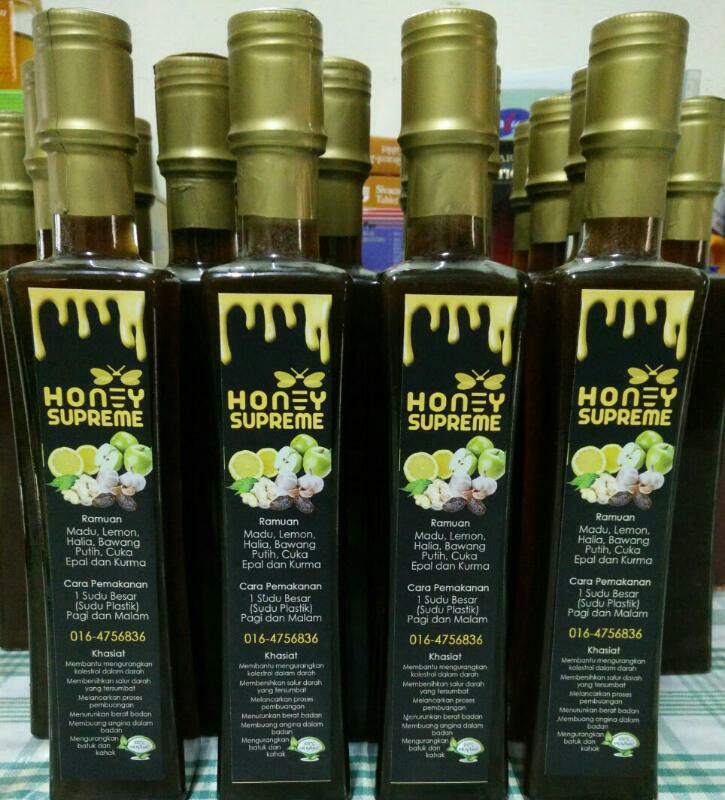 On Saturday, a chess tournament for juniors especially in the southern region will be held at Giant Plentong Hypermarket located in Masai, JB. The tournament which is divided into two categories - Under 12 (primary school) and Under 17 (secondary school) will be played in 7 SWISS rounds of 20-minute-per player format. It is organized by Giant Plentong Hypermarket, JB Chess Association and Rakan Muda Johor Bahru. Click here for further details and download the entry form. On Sunday, there are two chess tournaments that GiLoCatur is aware of. One is for juniors only while the other one is for OKU and team participation. At SJK(C) Kepong 2, the 18th edition of Kepong Juniors Open chess tournament will be held. Unfortunately, it is already full meaning no more new registration will be accepted. There are four categories which offer championship trophy. The tournament has high value in GiLoCatur's eyes because it is a national-rated event and allow participants to play against their own peers. Why a national-rated event has high value? It will provide the bench mark and progress of a chess player. Don't worry for those who cannot take part in the Kepong Juniors event. 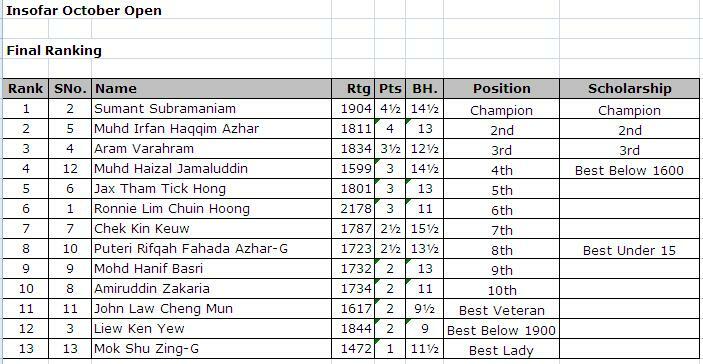 Another event which is known as Braille chess tournament is still open for the Malaysian chess community on the same day. The event has two categories which are Individual for the blinds and team open. The entry fee for the team event is only RM50 per team which comprises four players. The event which is jointly organized by KL Braille Resources and DBKL will be held at the closed stadium of Titiwangsa Lake. To download the entry form and find out further details, please go to this blog. The closing date is on the coming 1st November. Last Sunday an Insofar Chess Tournament was held at the Kompleks Wilayah. The tournament was divided into two categories - Open and Under 1600. As per its blog here, both categories of the tournament are national-rated. Below are the final results as per emailed by the tournament's arbiter, Mr Najib Wahab. 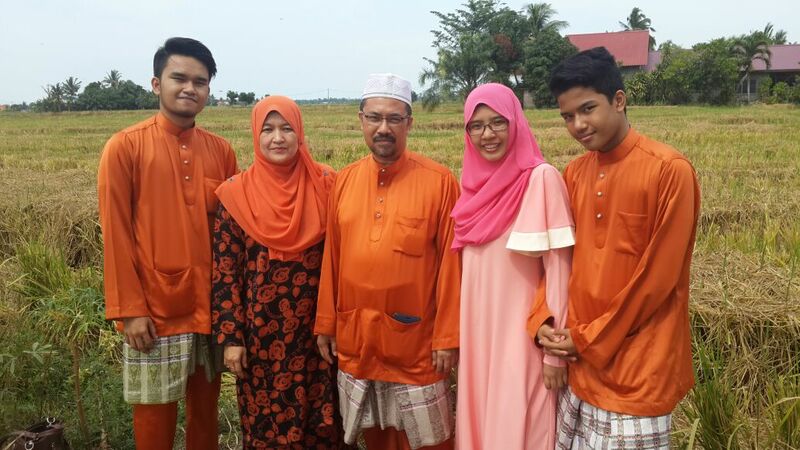 This coming weekend will be a bit longer since Eidul Adha or Hari Raya Haji will be on Friday. Thus, it will be a public holiday. On Sunday, there will be another nationally-rated chess tournament known as CAS Allegro organized by the Chess Association of Selangor. GiLoCatur's name is listed at the top in the Category 1 list. But it looks like that GiLoCatur will not get the chance to take part for a certain reason. So far more than seventy players have registered. Will the list become longer? Who will emerge as the champion? SEE YOU AT THE KOMPLEKS WILAYAH THIS COMING SUNDAY! GiLoCatur wonders whether the Malaysian chess community especially the young and new ones know who IM Yee Weng is. 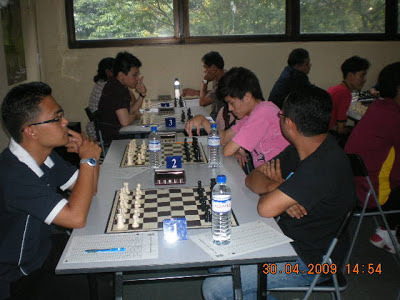 It is a puzzle to GiLoCatur that many Malaysian chess players and enthusiasts do not know about Malaysian top players. For example, do you know how many chess masters - Grand (GM), International (IM) and Fide (FM), Malaysia has so far? And once again it will be a big puzzle to GiLoCatur if a Malaysian chess player still can't find the answer in the now "maklumat di hujung jari" era. Back to GiLoCatur's earlier question, please spend your time to read the interview with IM Lim Yee Weng by Junior Tay here to get some info and insights about him. Maybe you can learn Sicilian Dragon moves and tricks from few of his annotated games published in the interview article. GiLoCatur began to know Yee Weng back in end of April of 2008. GiLoCatur along with both Fikri and Anis took part in our first FIDE-rated chess tournament, the 35th Selangor International Open. 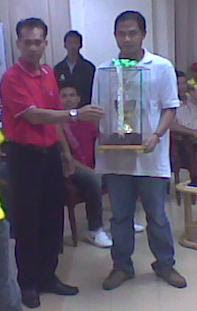 Yee Weng emerged as the champion after scoring 7.5/9 points. In the following year in the 36th edition of the Selangor Open, IM Yee Weng who is one year junior of IM Mas and is same age as IM Zi Jing tried to defend his title. Click here to find out whether he succeeded the feat. GiLoCatur made several coverages on Yee Weng's international stints here, here, here and here. GiLoCatur would like to wish IM Yee Weng BEST OF LUCK in his dream and aim to become a Grand Master (GM). Who knows, he might be the FIRST Malaysian GM. The UPSI Chess Open was just been concluded last weekend. This year is its 6th edition. 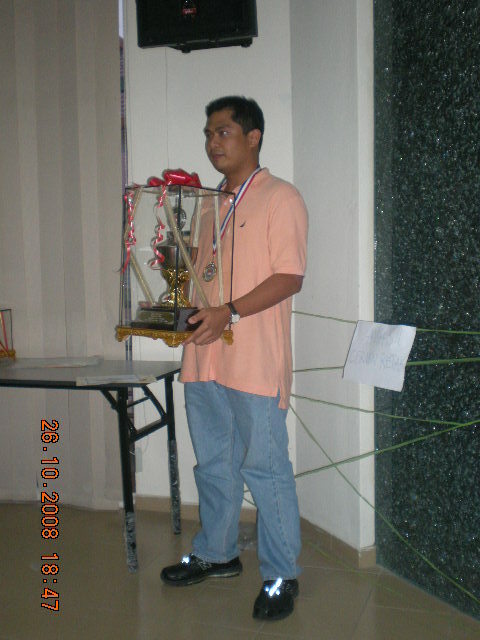 To GiLoCatur's knowledge, this chess tournament began its annual tradition since the year of 2007. GiLoCatur and the kids had attended three of the total six editions. We missed to take part in the two-day event last weekend since GiLoCatur's children need to focus on the final examination. For those who were not at UPSI and want to know the final results of the tournament, please check out the chess-results website at following links - Open. Secondary and Primary categories. The champion of the Open category went to Malaysian-based Filipino Ian Udani. In GiLoCatur's opinion, Ian has great record and the most successful chess player in the UPSI Chess Open so far. Why GiLoCatur said that? 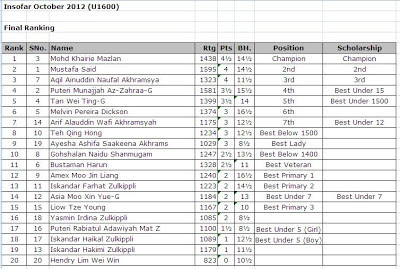 Check out the Top 3 Winners of the UPSI Chess Open editions below. Does anyone know who were the Top 3 Winners for its first edition in 2007? If yes, please let GiLoCatur know. Ian Udani became the champion in both 2008 and 2009 editions. In 2008, the first runner up was won by Kamaluddin Yusof aka Abang Bro while the 2nd runner up spot was grabbed by NM Mohd Kamal Abdullah. 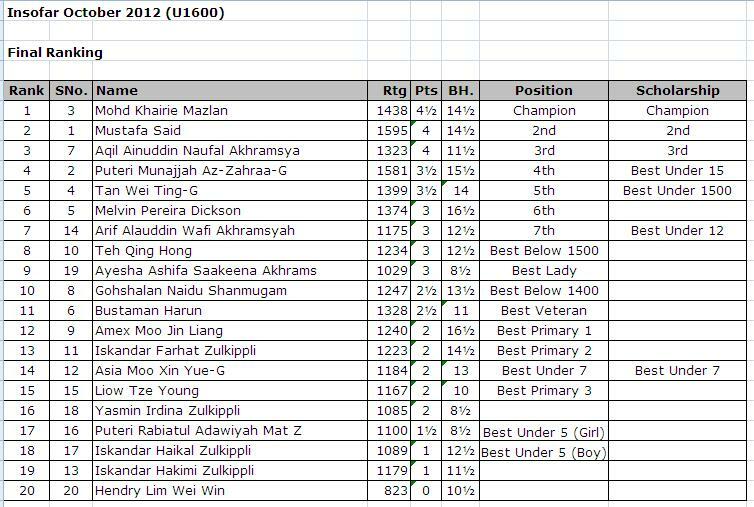 In 2009, Nur Nabila Azman Hisham becomes the only girl/lady player to be among the Top 3 Winners so far after she managed to win the 1st runner up spot. Who was the 2nd runner up? The answer is Abdullah Che Hassan. In the 2010 edition, it was an all-Malaysian affair. Mohd Syakir Shazmeer, the eldest son of Azhar Mohd Said, who was the champion of the Secondary school category in previous year, emerged as the champion of the 4th edition. The second and third placing went to Mohd Saprin Sabri and Sumant Subramaniam respectively. If GiLoCatur is not mistaken, Ian did not participate that year. Ian Udani came back in the following year. But its attempt to win the championship hattrick in 2011 was stopped by the then Malaysian top chess player, IM Mas Hafizulhelmi. Both of them drew against each other and had same points. But the former i.e. IM Mas emerged as the champion because he had better tie break. while the latter i.e. Ian Udani was declared the 1st runner up. Who was the 2nd runner up? The correct answer is Mohd Syazwan Zulkifli. Last weekend, both IM Mas and Ian Udani took part in the 6th edition of the UPSI Chess Open. The former was to defend his title especially against his rivalry opponent, the two-time champion Ian. While the latter wants to make a history to become the first one to make the hattrick in winning the chess tournament. At last, Ian Udani fulfilled his mission when he managed to win over IM Mas in the sixth round. In the final round, a draw is enough for Ian to score 6.5/7 points and won the championship. Even though, IM Mas won his last round game but a draw with another Filipino player in the fourth round and having 5.5/7 points he was denied to be among the Top 3 winners. Two players with 6/7 points had pipped IM Mas to emerge as the 1st and 2nd runner ups. They are Nelson Villanueva, another Malaysian-based Filipino chess player, and Aram Varahram whom GiLoCatur believes is from India. 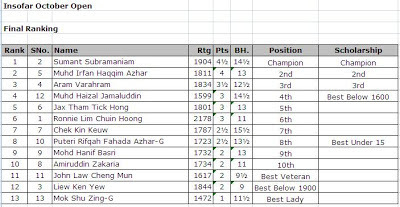 [Correction - Iraq, 19/10/2012 00:48am] If that so, it is the first time to be all-non-Malaysian Top 3 Winners affair in the UPSI Chess Open editions. Isn't it a great achievement for Ian Udani to emerge champion THREE times and became the first runner up ONE time in the total FOUR editions of the UPSI Chess Open he participated? In cash terms, no doubt Ian had accumulated the most money prizes in the history of UPSI Chess Open. Well Done, Ian! It had been about three weeks that this blog had not been updated. Wow! What's happening to GiLoCatur? Does he lose interest in blogging? Does he lose enthusiasm in chess? Is he really very busy at work? In this entry, let's take a look at the statistics of this blog's number of entries since its beginning in May more than four years ago. 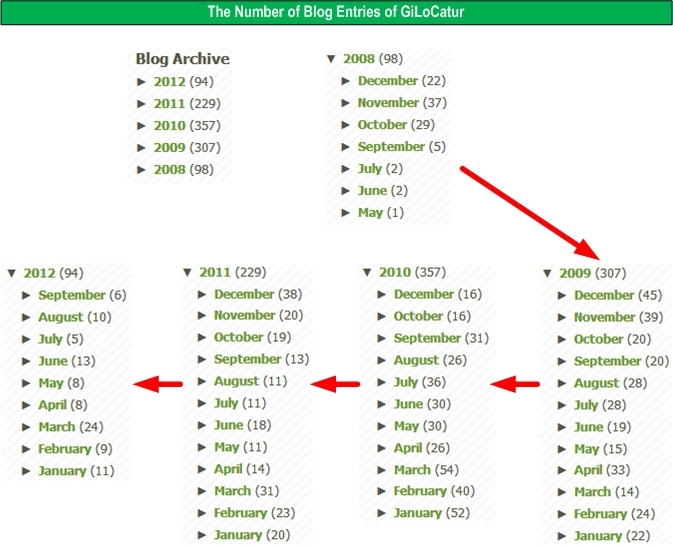 In the seven months of the first year of GiLoCatur's blog existence, ninety eight (98) entries had been written. The highest entry in 2008 was in the month of November with thirty seven (37) entries. In the next two years i.e. 2009 and 2010, GiLoCatur wrote more than three hundreds entries. 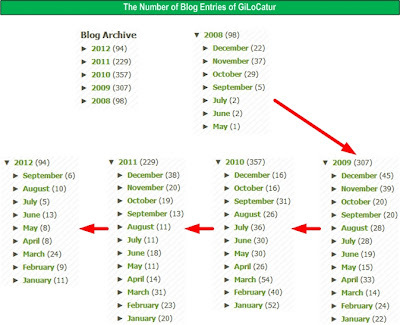 GiLoCatur wrote almost everyday especially in 2010, the highest number of annual blog entries so far. Then, the number decreased to just about two hundreds entries last year. And it continues the declining trend where this year the number of entries has yet pass the one hundred mark. GiLoCatur would like to say TQVM (Thank you very much) from the bottom of GiLoCatur's heart to all the visitors and readers of this blog. GiLoCatur will try to write more in the future. Hopefully, the Almighty Allah bestows great mood, motivation, energy, enthusiasm, passion and creative ideas to GiLoCatur to elighten the Malaysian chess blogging community. Let GiLoCatur end this entry with a couple puzzles. Not chess puzzles ya!